Taking a look back at last year there were a lot of Neocash items released. Roughly 1250 new items in just the course of one year! How do the artists manage? After lurking the boards for the past year, and being a part of the NC in general, I am here to tell you what I think have been the biggest hits of the NC. I'm not including Gift Box Capsules, because if I did that they would be the only item on this list, because who doesn't love GBC? Also not included were items that had just been rereleased this year. Yes, you had a chance to get that uber fabulous New Years in Faerieland this year, but that item had not been first released in Y14. So to start us off, here is #10 on the list! This is the only Key Quest Token item to make the list. The reason for this is that I have seen this item on so many wishlists ever since it was first released. It is even hard to find someone who has this wig up for trade. No one really wants to activate another KQ token to get a second wig, so most people only have one copy. It also goes great with many different customizations, especially with purple and dark coloured pets. Luckily for you, if you have missed out on this item, you can still find the Purple Kiko Key Quest Token in the mall. Contacts are always a big hit on the NC. They can give that pet just the extra oomph, when it comes to customization. These were only recently popular since they were not released until people started to get the Holiday Snowballs from this year's Advent Calendar. The big factor in them being so sought after was the fact that you could not get them on your side account. The only way to get them was to get a prize from the Snowflake event at the Advent Calendar, and that is not allowed on sides. Another reason was that it was completely random as to which items you got from the Holiday Snowballs. There were ten items total and you had no idea which ones you would get. So you might have only been able to melt nine Holiday Snowballs and did not get the Snowflake Contacts. Just the risk you would have to take to get this sought after item. This item was awarded during the Altador Cup. To get it you needed to activate an Altador Cup VII VIP Lounge Pass. Once activated you would be able to claim a new prize each day. This item continues to turn up on wishlists just because of the whole sparkly effect. Maybe it is just because the NC loves sparkly and glittery things, but it is a nice and simple item. It adds a bit of shine to your pet without it looking glaringly obvious. Whereas some items are very flashy, bright, and sparkly this item does not overwhelm you at all. If you just want a little bit of sparkle, then this is the perfect item to use. This item has earned a spot because of all the craziness that happened when it was first released. It is a bonus item from the Dark Faerie Blueprint (#D7M). When the Meepit Stache game was first activated this was one of the original blueprints. For the first few weeks it seemed as if no one had been able to get the bonus Dark Faerie Magic Orbs. Only a handful of people mentioned they had been lucky enough to win this item, but they were not interested in trading it. Eventually enough people started to get this bonus item, but that was not until much later after its initial release. Because of the whole mad rush for this item when it first came out, it earned a place on this list. Halfway through and we come to Heart of the Forest. This was the bonus item for sending a Heartfelt Sweetheart Gram during the Share the Love Community Challenge. If you sent at least one of those grams to someone (even sending one to yourself!) you were awarded this item at the end of the challenge. Even though many people received this item at the end, it was still highly sought after. It is a great item because it can add just a touch of scenery that is needed in an idea. Maybe your pet is in a forest and none of the backgrounds you have really work. Well, with this item it can add just that perfect amount of forest to an otherwise treeless background. I have not seen it on many wishlists lately, but that might just be because it is winter in Neopia right now. 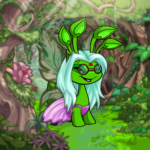 All the pets are dressed up in snowy forest styles. Once the warm weather rolls around again I would not be surprised to see this at the top of people's wishlists. The MMEs always have the longest names possible! But regardless of name length this item was incredibly popular upon release. This MME was sort like a themed set of items. One of the MMEs morphed into the wig, another into a genie shirt, and the last one into a pair of genie pants. Only if you got all 3 MMEs would you have the full genie set. Out of the three items the wig was the most popular. Along with contacts, people on the NC cannot pass up a good wig! It was a very unique design and can go great with desert style customizations. I'm still finding it on many wishlists even months after its release. This item was largely controversial when it was first released. People did not like the fact that you could pay to get Faerie Quests. It has died down, since the cookies have been in the mall for seven months at this point. The reason I rank this so highly is just because of what it offers you, and what everyone complained about. You can do Faerie Quests! That battledome pet you have been training will be able to train even faster now. But that's not all! You even have a chance of getting a Fountain Faerie Quest. Probably one of the most highly sought after random events, since you can paint your pet nearly any colour. People always seem to be looking for these cookies, almost as much as they are seeking Gift Box Capsules. Checking the mall you can see that most of the time these cookies are sold out. If you are not into the battledome, then I can see how you may not be as excited about this item. But it still caused quite a stir on the NC, and Neo in general. Many of you probably even forgot that this had been released in Y14, I know I did. This was the Limited Edition prize for the Eerie Winter Snow Mystery Capsule. This was the last capsule to be released before TNT changed how often capsules would award the LEs. People were going crazy trying to open capsules to get this prize. It is a great wintery themed background, and everyone wanted to get their hands on one. The problem was that it was nearly impossible to get. This made it super sought after upon release. Eventually the excitement died down when it was rereleased in the NC Mall Birthday Capsules, but there were a few months in between the releases. This was one of the biggest items during the winter season earlier in Y14. Now we finally make it to the #1 spot. I bet a few NC regulars can guess what this next item is. Yes, that's right. The most highly sought after item of Y14, and quite possibly the only item to jump up to a ~30-35 capsule value, literally overnight! For anyone not a regular of the NC, this basically means you would need to trade someone 30 capsules from the NC mall for this single item! When it was first released it seemed as if no one liked the item. People were unsure about it and wanted to get rid of it. But it quickly started to rise in value and more people wanted to get one, and so it went up in value even more, and continued in this pattern. To give it credit, it is a very unique item. 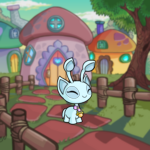 There are no other petpets on a leash that you can use in customization. Who would not want their own pair of fierce looking guards? But because of all the hype around this item, and how quickly it climbed in value, it deserves the top spot on this list. So now I have finished up this top 10 list. Hopefully we can see some many more interesting items in Y15!